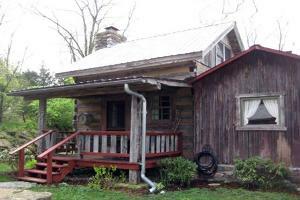 If you’re looking for a ultimate log cabin retreat then look no more. Our cabin is a unique, small, authentic 19th century log home, nestled among pines trees while overlooking a pond. Francine’s Log Cabin is located in Jefferson County, IN, only 12 miles from Historical Downtown Madison IN, Madison features 133 blocks and over 2000 notable structures all listed on National Resister of Historic places. Just 20 miles north is Vevay IN and Belterra Casino and Championship Golf course. The cabin is close to Splinters Ridge, A 2,460 public hunting area. Boating on the Ohio river is just a mere 15 minute drive or you might want to pack a lunch and drive to Indiana Wine trail, Big Oaks National Wildlife refuge, Clifty Falls State Park, Dining, Art Galleries and an assortment of antique shops short driving distance. No matter how you choose to spend your day, Francine’s Log Cabin offers a peaceful, relaxed inspiring atmosphere where you can escape the stresses of life and reconnect with the people and things you love. Once availability and your reservation are confirmed, you may make your payment by clicking on the payment method or by sending a check. If cancellations are made at least 10 days in advance of your arrival there is a $75.00 processing fee. There will be no refunds if cancellations are made within 10 days of the arrival date. Last minute reservations: if your in town and would like to stay at the cabin, contact me and I will see what I can do for you.